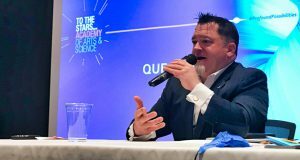 At the UFO DATA conference in October 2007, I met up with veteran UFO investigator David Beezer. I’ve known David for many years and he has regularly attended many of our public events. David wanted me to read a report he had received from a RAF officer, but on the day I simply did not have the time. David made me a copy of the report in question and I read it a day or two after the conference had finished. 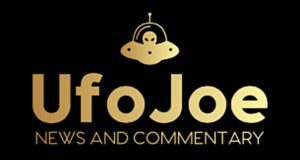 The report came from a Mr. Alan Turner, Member of the Most Excellent Order of the British Empire (MBE), and concerned a UFO observed on radar at Royal Air Force (RAF) base Sopley in the summer of l971. I subsequently contact Mr. Turner and have his permission to document the following. His report is published in full. 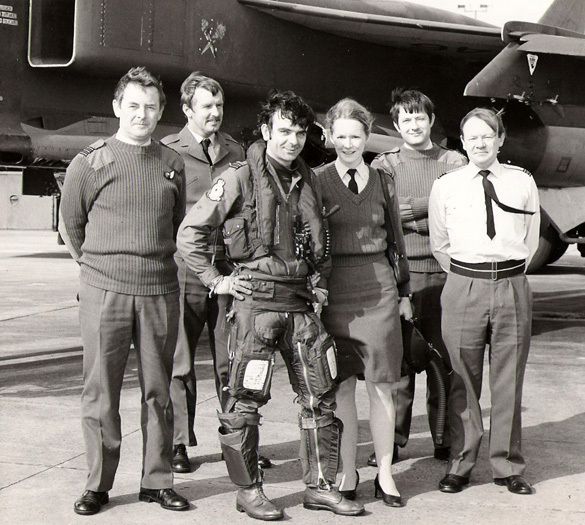 Alan Turner was aged twenty-five when he joined the Royal Air Force in l966 and was commissioned that year as an Air Traffic Control Officer. RAF Sopley was a wartime bunker, which had been converted into a joint military/civilian Air Traffic Control Radar Unit (ATCRU): it closed in l974 when both the civil and military ATC functions were transferred to West Drayton. 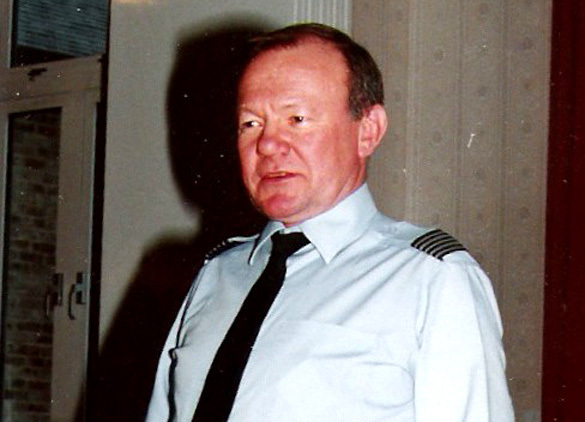 Alan Turner remained in the RAF eventually to command the Central ATC School from 1990 to 1992. In July 1995, he was discharged from the RAF in the rank of Wing Commander. 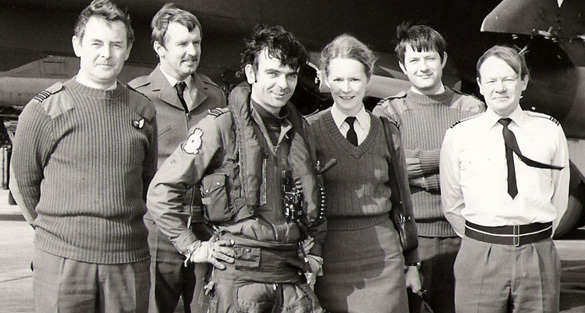 1982: This was taken in l982 when Alan Turner was the Senior Air Traffic Control Officer at RAF Lossiemouth. He is pictured on the right. In the summer of 1971, I was the Duty Military Supervisor at RAF Sopley, which was a joint military/civil Air Traffic Control Radar Unit (ATCRU). It was a Tuesday afternoon but I cannot remember the exact date. The Duty Civil Supervisor drew my attention to a situation on radar the likes of which neither of us had ever encountered. Emanating from a point some twenty nautical miles east of the eastern extremity of the Salisbury Plain Danger Area were a series of six or seven blips moving on a south-easterly track each being separated from the other by about six miles. At about forty miles from the point they appeared on radar they disappeared to be followed almost immediately by a replacement at the point of origin. I put the FPS 6 Height Finder onto some returns to discover that they were about 3000 feet when they came into radar cover and climbing extremely rapidly so that, by the time they disappeared from radar, they were in excess of 60,000 feet. To climb to such a height in only forty miles was beyond the ability of any fighter aircraft at the time. 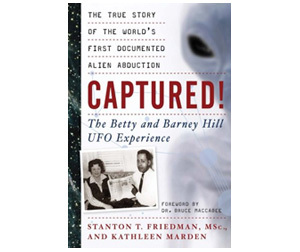 The phenomenon was witnessed by four civil and six military controllers on duty at the time. I called Heathrow Radar to discover that they, also, were seeing a similar picture. The same situation prevailed in the Fighter Control Operations Rooms at RAF Neatishead. The three units involved operated different radars from each other thus different frequencies were in use. The weather forecast from the south of England was calm and sunny. I called the Met Office to confirm the strength of the upper winds to find that they were also relatively calm and were about fifty degrees off the southeasterly track of the blips; they also confirmed that there were not Met balloons/probes airborne at the time. The winds were not strong enough, nor in the right direction, to cause the blips to travel on their observed track, especially at the speed they were travelling. It was estimated that they were doing around 250 knots, but it must be borne in mind that this was a lateral speed as seen on radar – they must have been travelling very much faster to climb over 50,000 feet in less than forty miles. Equally the weather was such that there were no ‘angels’ to affect the radar picture. 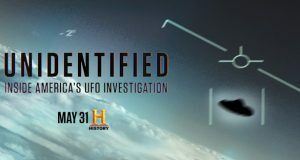 “Angels” was a euphemism for, what were believed to be, ionozed pockets of air which, under very specific atmospheric conditions, were often seen on radar screens in those days: when seen, these ‘angels’ traveled extremely slowly simply drifting along haphazard tracks. In those days all radars were ‘raw’. That is to say that, whatever was within the coverage of the radar envelope and capable of bouncing (returning) the radar pulse back to the receiver, would be seen on the radar tube. Today’s radars are computerised thus such interference is processed out so as not to affect the picture. Looking around for some other method of checking what was going on, I discovered that a controller had two Canberras on frequency returning from Germany. One of the pilots agreed to investigate so I assumed control of his aircraft and, having confirmed he was in good visual met conditions, I vectored him on to the blips keeping him regularly updated on their position relative to the Canberra. The aircraft was flying at around nineteen thousand feel and when it got within a mile or so of one particular blip, the pilot reported, in a very agitated voice, that his radar had picked something up heading down his port side by about a quarter of a mile and ‘climbing like the clappers’, it was on a reciprocal heading to the Canberra. The pilot admitted that neither he nor his navigator made any visual contact and confirmed that the weather conditions were such that they would have had no difficultly seeing something that close. The whole episode lasted for twenty minutes or more before the blips stopped appearing. I impounded the R/T tapes and the Radar Video film and made appropriate entries in the log. Each person in the Ops Room who witnessed the incident was required to write a report. The Squadron Leader in charge of Operations collated the reports and informed higher authority. Within a couple of days I was interviewed in the Squadron Leader’s office by two men who were not identified to me. I, along with all the others in the Ops Room on the day in question, were told in no uncertain terms not to relate what we had seen until cleared to do so. About four years later I was serving at RAF Wattisham when the Station Commander asked to see me. I was told that he had a communication from the MoD about the incident at Sopley and that as ‘nothing could be confirmed’ the situation was such that doubt would be cast on anything I said about it. I took this to mean that I was no longer to remain silent. I am at a loss to explain what I, and many other people, saw. In those days aircraft could not climb at such a rate. To be seen on displays by three different ground radars, plus the airborne radar in the Canberra, is also a mystery. The weather conditions were very definitely VMC or Visual Met Conditions; the aircraft was clear of cloud by at least a thousand feet vertically and with a forward visibility of at least five nautical miles. Alan Turner MBE 10th November 2007. 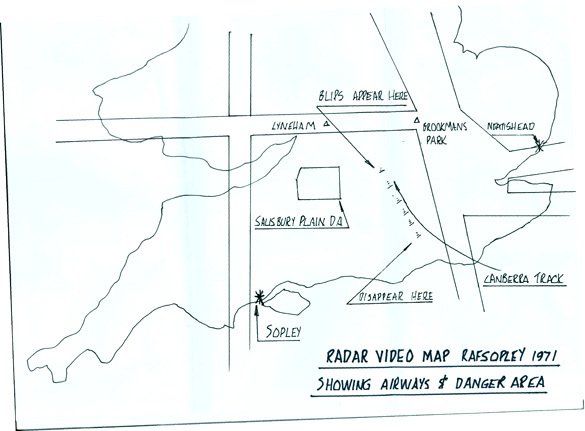 Map: Map of the area showing the track on the unidentified radar target. Map supplied by Alan Turner. 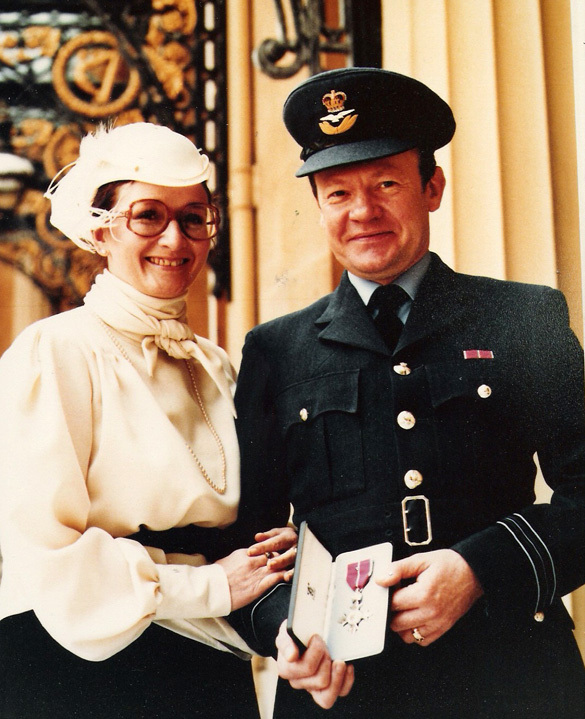 1984: This is Wing Commander Alan Turner and his wife Diane at Buckingham Palace where he received his MBE from Her Majesty Queen Elizabeth II in l984. 1994: Alan Turner at a social function during his last appointment with the RAF in l994. Thanks must go to David Beezer for supplying the information and contact details and special thanks to Alan Turner MBE for allowing me to publish his account. All photographs copyright Alan Turner MBE and reproduced with his kind permission. Ever realised why there are very few anomalous radar reports these days? The antennas, pulses and computer examination of the returns are all so much more sophisticated now.